Sam, Marcus & Holly’s KI Surf Trip. 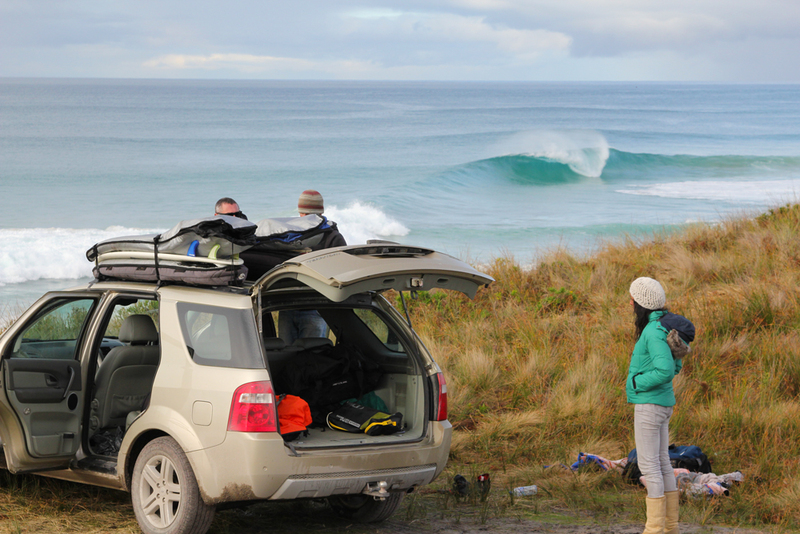 2 Day King Island Surf Package. 20-21st June. Sam & Marcus couldn't get the boards off quick enough. It was an early start for Marcus, who woke up at 5am to drive from Dromana on the Mornington Peninsula picking Sam from Melbourne, eventually meeting Holly and I at the Barwon Heads Airport on a freezing Saturday winter's morning. After a quick debrief from Anatole (our legend pilot) and loading the boards on the plane we set off at 8am with smooth skies and a slight SW wind. We were hoping to surf the famous “A” frame beaches of Martha Lavinia, but the forecast was for smallish waves so we discussed a few other options on the island to surf. As we flew over Bells Beach and across Bass Straight we could see some lines rolling in so we were optimistic about there being some swell. As we approached the island and flew over the northern tip, we could see massive waves breaking off the light house. So we asked Anatole if he could do a fly-by over Martha and check the waves from the air? “No probs” he said. As we flew above Martha we could see the swell lines coming in from the north and south to form perfect “A” frame waves up and down the beach for as far as our eyes could see. We knew then it was on, we just weren’t sure how big it was! It was a chilly start loading the boards. As we touch down to King Island airport at 9am, throwing the boards and gear in the car which was waiting for us fuelled up with keys already in it (this would have been stolen in a flash in Werribee) we V-lined it to Martha. Avoiding the cows, wallabies, deer, peacocks jumping out like a video game on our way there. Pulling into the sandy 4WD tracks into the dunes, our first sight of the ocean we saw framed between two sand dunes either side, a single perfect A frame wave, about 4 foot, perfectly symmetrical, super hollow, spitting spray out of the left and right tube simultaneously, like the grey lead drawings I used to draw and dream about in high school. Of course nobody had their camera ready at this point… we just all soaked it in, looked at each other, and giggled like grommets. That was the start of our epic trip, surfing and giggling for 4 hours till our 38-40 year old bodies gave up and we were hungry for some of Ana’s (our KI host) sandwiches and wallaby rissoles ready for round 2. The swell dropped a little to a fun 2-3ft in the afternoon / evening session but we stayed out till dark until our eyes couldn’t focus on the incoming sets any longer. That night we reflected on that first perfect wave we all witnessed, recalled the waves we got, as well as all the waves we missed and couldn’t quite believe we had just surfed all day on a weekend without seeing another surfer in the water. Marcus admires this one before receiving it on the head. Sam contemplates which board to take out. Sunday morning we had another perfect sunny day, the swell had dropped a little overnight, but the ocean was glassy and looking inviting (so much for King Island being windy!). We checked out a couple of known spots which were looking pretty good, but our wetsuits were still wet and cold, and we decided to wait till the warmth of the sun to come up before heading to Marthas where we surfed for one last time. Again we were the only surfers in the water just relaxing as we “yeww’d” each others waves, laughed as we kooked more than we got but it didn’t matter at that stage we’d already had so many waves, that we were no longer those frustrated old salt dogs… just enjoying the privilege of being there in what felt like Australia - in another era of time. The northerly wind got up in the afternoon so we decided to gorge ourselves at the cheese factory and head down south to see if we could discover any secret breaks for next time before we had to meet Anatole at 4pm to fly back to modern civilisation.